Has anyone taken the temperature of the outside vs. inside of their outdoor rabbit hutch or shed? Or better yet have a record over time of this. I can't find this on the forum or the internet, only information about how to insulate sheds or hutches, but not this sort of evidence saying it works. Oh really? Thanks, that's reassuring. I just can't think a wooden box would keep them much warmer but I have never been in a shed or hutch with insulation to know the difference. Insulation does make quite a difference. I use a max/min thermometer but it is on the coldest part of a mesh door. In winter, the water bowls / bottles shouldn't freeze in a well insulated hutch or shed. It also means that other wet patches don't freeze, so keeping it clean and tidy is much easier. In summer, it protects the inhabitants from overheating. You still need some decent ventilation, though, but not so the wind blasts in. How do you insulate a shed? Sorry I've seen people putting insulation foam etc on the walls, but what do you put over that to stop the buns chewing it? on the FB UK rabbit group, many insulate aviaries or their sheds. many report it being quite warm inside the shed, compared to the outside ofc, but it can be a big range in temps. for some is -5 out and 5 inside the shed. one lady covers her aviary (I can't for the life of me remember what), outside was -3, inside was 3c, and then inside the hutch which she insulated was 7 or so. it does make a huge difference. ofc they will have their winter coats, but it can help keep them a bit warmer and offer them a warm place to hide. in the wild they would be deep underground snuggled up together for more warm, so (to me) it only makes sense to do similar. a hutch inside an aviary or a shed would be their "burrow" so to speak. it does make a huge difference and I would always suggest for people to do it, for buns sake so they can not be so cold and still enjoy themselves and have somewhere warmer to go to when they want it. but also if they want to be out in the cold, they can. usually people put the insulation higher up the wall so the bun can't chew it, or they get solid panels and put them around the edges to stop the buns getting at it. I know one person who used puppy panels with cardboard behind it for the gaps and then the insulation. but I've never done it myself so I can't comment. I use sheets of expanded polystyrene from Wickes. They are really easy to cut by scoring (eg with a pencil) and gently breaking along the line, and don't really need fastening in as you can jam them in the gaps. Cover with thin ply nailed to the cross bars and edges, then paint or varnish it so it is easy to keep clean. The last one I did, I used left over white emulsion paint which really brightens up the inside of a large hutch. This is great, thanks so much. It must make a big difference to the rabbits. I'm not sure it will be enough for what I was thinking. We're having a baby in March and my partner gets wheezy from the rabbits and I get allergies to the hay sometimes as they're in the living room, but we're okay with that. 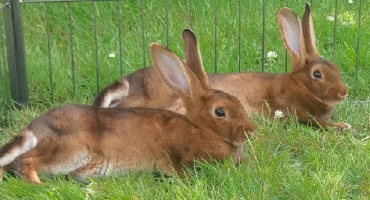 But I'm concerned the baby will be more delicate and we'll be in the living room a lot so I think we need to move the rabbits out, but they're indoor and have been for a couple of years. Average temperature is high of 7°c and low of 3°c on a night around that time, I think they're going to be too cold as they'll be without winter coats. I don't want them to go outside but I don't know what the alternative is or where else to put them in the house. We have kitchen, living room, and dining room/stairs/landing is all one room, it's the first room from the porch so like a hallway too. I wanted it organised before baby comes but we might have to cope until after April/May instead. & yes - the expanded polystyrene is so easy to cut and put in the gaps. I use the reasoning that in a burrow the temp would never get below 0degC, so an outside hutch shouldn't. a useful device is a 'max/min' thermometer so it's easy to monitor what the lowest temp is that the hutch gets to overnight. Last edited by mikek; 10-11-2018 at 08:58 AM.